About Us — PawFriction. Restore your senior dog's traction the natural way. Let us help them get back on their feet. After years of development and testing, PawFriction went to market in 2015. Currently available online and through a growing number of Veterinary Clinics and Professional Groomer, PawFriction continues to grow by expanding into retail. Without use, muscles lose their tone and flexibility and atrophy over time. Unfortunately, many degenerative diseases worsen without movement and exercise. PawFriction allows your dogs to use their muscles as they normally would, enabling them to strengthen and help fight off orthopedic, neurological and degenerative diseases such as arthritis and dysplasia. 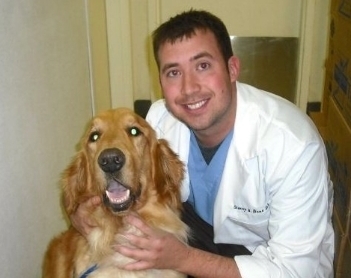 In addition, your vet may recommend PawFriction as part of their post-operative rehabilitation. PawFriction enhances your dog’s downward leg force by preventing lateral slipping and splay-legging increasing mobility and confidence. We have seen significant improvement with our rehabilitation patients that have decreased stability or muscle weakness. Pawfriction is used with post-operative orthopedic and neurologic patients with great success during their recovery. The best results we have seen with this product is with senior canines that have chronic arthritis and muscle weakness. It is great to have another tool to help pets feel more comfortable and improve their quality of life. Abby Whiting, DVM and “Loki"
Thank you so much for returning my dog's mobility and confidence. My 16 year old Shih Tzu, Loki, was struggling with osteoarthritis and rear limb stability. We had tried several different types of dog boots, but he was uncomfortable in all of them, and his mobility was worse. Once we applied PawFriction he was his old self again! He was no longer slipping and falling on the wood floors, and since the other dogs couldn't knock him off balance when they got excited, his confidence was restored. I realized when it was time for his first re-application when I heard him slip and fall coming around the kitchen island. It was a sound I hadn't heard in weeks. I now recommend PawFriction in my veterinary practice. I use it in cases of arthritis, neuromuscular disease, post orthopedic surgery, and more. It is easy to apply and the dogs are so comfortable wearing it. We cannot thank you enough!